Are you planning a Frozen themed party or gathering for the little ones, or perhaps looking for easy crafts to do with kids? 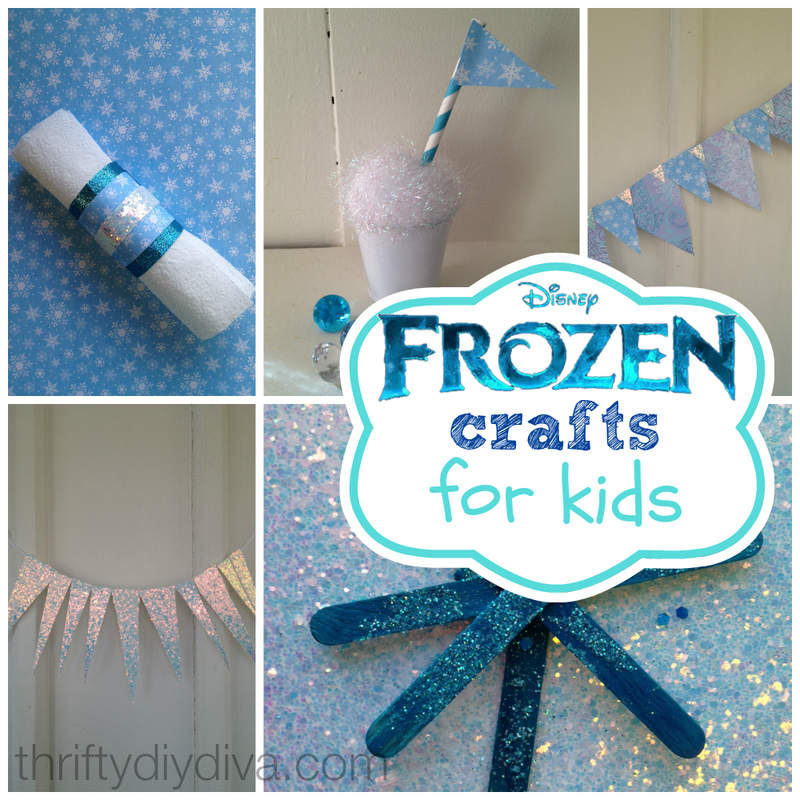 If so, you will want to check out these fun Disney Frozen Crafts For Kids On A Budget! Sure, you could head to the store or Amazon.com and buy some, spending a great deal of cash in the process. Or, you can make your own for just pennies! Take a peek below at some Frozen inspired party décor for you to try out. You don’t have to be a crafty queen to make these items; you just need a few supplies and the soundtrack playing in the background! Take a look! What is a Frozen party without a little ice? Make your own easy icicle banner to add a little chill to your space instantly. When strung up, it will look like icicles galore. To make your icicles banner, cut out thin and long triangles from your paper. Don’t worry about them being perfect, in fact, you want them all different from each other. Add a dab of glue to the back/top of each icicle and press it to the string. Continue this process until you have long strands of icicles to hang in banner style. Make your own party banner perfect for draping at your entrance or from your food table. To make your party banner, cut out triangles in a variety of sizes from the scrapbook paper. Layer the triangles on top of each other, gluing the pieces together as you do. Assembled the layered triangles onto the string and secure with glue. Hang when dry! Add some fancy fun to your party when you make these Frozen inspired napkin rings! Assorted scrapbook paper sheets in silver, snowflake, blue, etc. Begin by cutting the cardboard toilet paper rolls into 2 inch strips. Roll each piece in scrapbook paper and cut to fit. Secure it with glue. Cut a strip of contrasting paper and wrap it around the ring, also cutting it to fit and securing with glue. Embellish with scrapbook cut outs or even additional strips, all layered to create a colorful effect. When dry, roll your napkins and insert into the rings. Presto! Why not let kids get into the Frozen spirit by creating their own sparkly snowflakes? Here is how they can make their own! Place some glue in the center of the first stick. Press another stick on top of it creating a T shape. Continue this process until you have stacked several sticks, adjusting them as you secure them to create snowflake shape. When the shape is made, brush some glue over the sticks and give a generous sprinkling of glitter for some pizzazz! Make guests feel special when you present them with their own place card holder. To make your own, you only need a few supplies. Take a look! Stuff the bucket with a generous amount of cotton or white pom poms. Nestle the straw into the cotton until secure. Cut a small flag from your scrapbook paper. This is where the recipient’s name will go. Attach the flag to the end of the straw with glue. Then, just fill it in and present when done. What did you think of these Frozen-inspired kids crafts? See how easy it can be to get into the spirit of Frozen with these easy and inexpensive crafts? Give them a try and really make your party pop! For even more Disney Frozen-inspired Party Fun, check out these ideas, too!